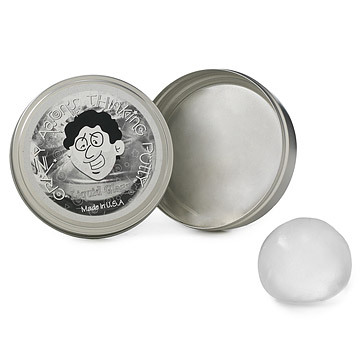 Have some tactile fun with this springy, bouncy, and crystal clear putty. A cooler version of the goop you grew up with, this translucent thinking putty outperforms juvenile paste with a consistency that's springier, less sticky and more fun to knead. Roll this handful into a rubber ball (did we mention it bounces? ), temporary sculpture or into a desktop game. It's easy to tear, fuse and bounce into shape. Bonus: It melts back into a tidy puddle when you're done for easy storing. Made in the USA. Tin container: 4" dia. x 1" H; Putty: 3.2 oz. Made with silicone-based inert non-toxic synthetic rubber; contains no latex/wheat compounds. Warning: Liquid Glass may leave a clear stain on paper and other surfaces. We recommend keeping it in its tin when you aren't playing with it. I had to buy another one for myself! It's helping with the arthritis in my hands. I'm not a medical expert but mobility has increased some. Purchased for the sons of a friend (12 & 10). Not really sure what they would like. Thought it looked neat. She has since shared that they loved this item and play all the time. They said it's looks like "glass" putty. Was a hit. Our neighbors have two of the most energetic positive kind and thoughtful daughters we have ever had the pleasure of meeting. Julie and Brian's two girls frequently visit and play with our two rescue dogs and love them as though they were their own. Our dogs absolutely love when these two marvelous young ladies come by to visit. Usually while their mom and dad and my husband and I are doing something for the community. It is such a nice reminder that there are such wonderful young ladies (and people) in this world. It truly gives me a sense of hope that just maybe tomorrow might be better than today. This product was great for a few days, but living with dogs made it get dirty very quickly. Now, if no longer looks like "glass." While still somewhat clear, the putty is a yucky color and has flecks of dog hair, dust, and string embedded into it. Product was ok... not great. My granddaughters play makeup colors transferred to putty and it is no longer clear. The product was fun to play with and looked cool! The putty was as advertised. Super cool for 13 yr-old boy. The packaging was a real problem, though. My daughters are into slime and puddy so this clear-as-liquid-glass one was a hit! They had never seen it advertised so it's fun to find a gift that I knew they'd be surprised by and love! They loved your magnetic puddy too! My 13 year old loves thinking putty. I had forgotten that she wanted some "glass" for Christmas and was pleased to find it here. My 17 yr old was entertained for hours. My son & his friends loved this! They mold things, keep their hands busy, make things. It was a hit & I will be buying more.